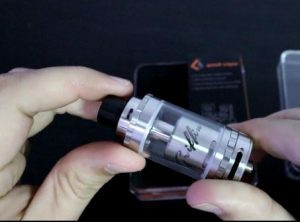 Geek Vape has become a popular brand within the market for quite some time now, and it’s mainly due to products like this Griffin 25 Plus RTA that I’ll be reviewing today. 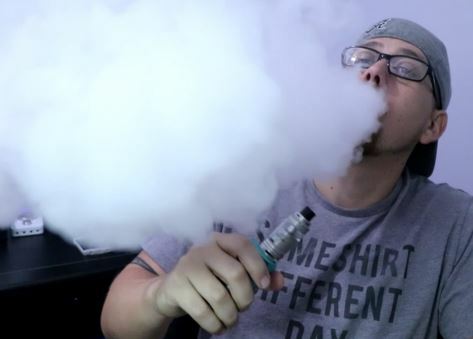 Though I don’t typically review rebuildable tank atomizers, due to my inability to wick them, Geek Vape insisted that I give the Griffin 25 Plus a chance, so I did. Thankfully Geek Vape pushed me onto this RTA, because it’s the first RTA design that I could successfully wick without any leaking issues, and what made it even better is that the tank performs exceptionally well! Appearance: When it comes to the appearance of the Griffin 25 Plus, I’m not overly pleased or jumping from excitement. Though there isn’t anything to complain about with its appearance, there also isn’t anything that is noteworthy about it – other than the top adjustable airflow. It provides a common tank look, but as I’ve learned throughout my life, looks aren’t everything. The top features a wide bore chuff cap with quad adjustable airflow. However, there’s also an optional flat cap that comes included to eliminate the top airflow capabilities. Just below is the tank, which look like any other tank from an RTA, such as the typical air inlet tube that leads to a larger chimney. On each side there are two juice holes, which are adjustable and rest at the top of the bottom base. Just under that is the bottom base, which has a ring for adjusting juice flow, and another ring below that allows you to adjust its wide dual airflow at the bottom. Features: Ready to brace yourself, because the Geek Vape Griffin 25 Plus RTA has several features that are definitely noteworthy. For starters, it features quad adjustable airflow at the top, and includes an optional delrin chuff cap to eliminate the top airflow and resort to a more minimalist look. The tank itself has a massive 5mL e-liquid capacity, as well as juice flow control. However, what’s most impressive about the tank is its build deck and airflow. The build deck is massive, 18.9mm to be exact. It features a Velocity two post design with two terminals per post, making dual coil setups easy to install and position. Just as a note, the Griffin 25 Plus RTA also comes with a ceramic part that allows you to do a single coil setup, which eliminates the airflow on one side of the deck. The most prominent part to this Griffin 25 Plus deck is the way its setup for wicking. Instead of having to insert the cotton into a hole or requiring that you have enough cotton for side juice holes, the juice holes on the Griffin 25 Plus are located on the bottom of the deck, meaning you can simply run your cotton through the coils, then let the cotton hang down enough to where it rests on the bottom of the deck, just like you would normally do with an RDA. Since there’s no required length of the cotton, other than making sure it reaches those bottom juice holes, it makes it easy to wick. With most RTA’s you have to be very precise with the amount of wicking — you can’t have too much or too little, because if you do you’ll either have a mess on your hands due to leaking or a burnt throat due to dry hits. Now the airflow is the last thing that is noteworthy about this tank. It has a Kennedy style airflow, meaning there’s two airflow tubes just under each coil. 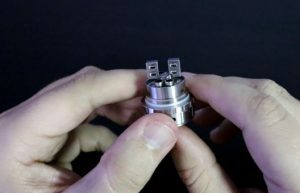 This style of airflow is known for producing better flavor since the air immediately hits the bottom of those coils as you take a pull. And, not to mention that since there is so much air being pulled through, that producing plenty of vapor comes without hassle. However, this tank does have dual bottom adjustable airflow, so you can reduce that amount of air coming in to your preference. Performance: The performance is equally matched with its features, and that’s a good sign. Often times, most tanks will have great features and may slack on performance, while others may perform great, but doesn’t offer as many features as other tanks. You know it’s an outstanding tank when you get the best of both worlds, and that’s exactly what you’re getting with the Griffin RTA. As mentioned, the airflow is great, it’s plentiful, and since that airflow is so good, you know producing big vape clouds is very easy. It’s nothing to throw out huge plumes with the right coil setup. And, being that it has a very spacious Velocity style deck, installing the intricate coils will allow you to take advantage of both flavor and vapor production. The Griffin 25 Plus RTA by Geek Vape is an incredible rebuildable tank atomizer. It performs great, has plenty of features, and though it isn't popping with its appearance, its other perks helps you easily look over its only shortcoming. What's most impressive about this tank is the way you wick it, being nearly identical to the way you build and wick an RDA. And, that's the very reason why I love this RTA, because it's easy to wick, it performs great, and there's not much more you can ask for in a rebuildable tank atomizer. If you're on the hunt for an RTA, I highly recommend the Griffin 25 Plus!